Komárek, J. and K. Anagnostidis. 1999. Süßwasserflora von Mitteleuropa. Band 19 (Cyanoprokaryota) Teil 1 (Chroococcales). Gustav Fischer Verlag. Stuttgart. 548pp. Phycology Section, Patrick Center for Environmental Research, Academy of Natural Sciences of Drexel University. Pleurocapsa minor (NADED 893002). 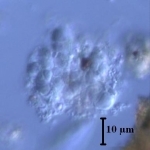 https://diatom.ansp.org/taxaservice/ShowTaxon1.ashx?naded_id=893002. Accessed 18 Apr 2019. This web service reports all information about a given algae taxon available at the time of retrieval.